Busch Stadium is the site of the matchup between the Milwaukee Brewers and the St. Louis Cardinals on Friday, September 29, 2017. The probable starting pitchers are Chase Anderson for the Brewers and John Gant for the Cardinals. Milwaukee opens at +152 while St. Louis opens at -162. The Brewers have a 67-84-7 over/under record and a 83-75-0 run line mark. The Cardinals are 75-83-0 against the run line and have a 80-70-8 over/under record. The Brewers have a 83-75 overall record this season. Starting pitcher Chase Anderson has a 11-4 record with an earned run average of 2.81 and a WHIP of 1.12. He has 128 strikeouts over his 134.1 innings pitched and he's given up 110 hits. He allows 7.4 hits per 9 innings and he has a FIP of 3.56. The bullpen has an earned run average of 3.83 and they have given up 501 base hits on the year. Teams are hitting .238 against the bullpen and they've struck out 599 hitters and walked 263 batters. As a team, Milwaukee allows 8.7 hits per nine innings while striking out 8.4 batters per nine innings. They are 9th in the league in team earned run average at 4.01. The Brewers pitchers collectively have given up 1,356 base hits and 628 earned runs. They have allowed 181 home runs this season, ranking them 24th in the league. 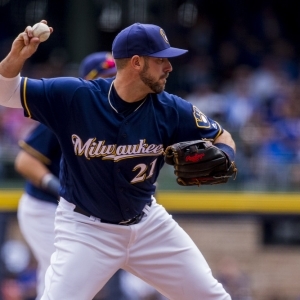 Milwaukee as a pitching staff has walked 541 batters and struck out 1,311. They have walked 3.5 men per 9 innings while striking out 8.4 per 9. They have a team WHIP of 1.35 and their FIP as a unit is 4.25. As a team Milwaukee is hitting .249, good for 21st in the league. The Brewers hold a .430 team slugging percentage and an on-base percentage of .321, which is good for 17th in baseball. They rank 22nd in MLB with 8.4 hits per game. Orlando Arcia is hitting .274 with an on-base percentage of .323. He has 136 hits this season in 496 at bats with 50 runs batted in. He has a slugging percentage of .407 and an OPS+ of 89. Domingo Santana is hitting .274 this year and he has an on-base percentage of .367. He has totaled 141 hits and he has driven in 83 men in 514 at bats. His OPS+ is 123 while his slugging percentage is at .498. The Brewers have 1,327 hits, including 261 doubles and 220 home runs. Milwaukee has walked 530 times so far this season and they have struck out 1,537 times as a unit. They have left 1,061 men on base and have a team OPS of .751. They score 4.5 runs per contest and have scored a total of 711 runs this year. St. Louis has a 82-76 overall mark this year. With an earned run average of 3.65, John Gant has a 0-0 record and a 1.38 WHIP. He has 8 strikeouts over the 12.1 innings he's pitched. He's also given up 10 hits. He allows 7.3 hits per nine innings and his FIP stands at 6.97. The bullpen has an earned run average of 3.88 and they have given up 481 base hits on the year. Teams are hitting .244 against the Cardinals bullpen. Their relievers have struck out 511 batters and walked 178 opposing hitters. As a team, St. Louis allows 8.6 hits per nine innings while striking out 8.4 batters per nine innings. They are 7th in the league in team earned run average at 4. The Cardinals pitchers as a team have surrendered 1,357 base knocks and 627 earned runs this season. They have given up 178 home runs this year, which ranks 27th in Major League Baseball. St. Louis as a staff has walked 477 hitters and struck out 1,315 batters. They give up a walk 3 times per 9 innings while they strike out 8.4 per 9. Their team WHIP is 1.30 while their FIP as a staff is 4.09. As a team, they are batting .258, good for 14th in the league. The Cardinals hold a .430 team slugging percentage and an on-base percentage of .336, which is good for 6th in baseball. They rank 15th in MLB with 8.7 hits per contest. Matt Carpenter comes into this matchup batting .243 with an OBP of .385. He has 120 hits this year along with 69 RBI in 493 AB's. He maintains a slugging percentage of .454 with an OPS+ of 120. Yadier Molina is hitting .273 this season and he has an OBP of .312. He has collected 137 hits in 501 at bats while driving in 82 runs. He has an OPS+ of 95 and a slugging percentage of .439. The Cardinals as a unit have 1,379 base hits, including 281 doubles and 193 homers. St. Louis has walked 581 times this year and they have struck out on 1,305 occasions. They have had 1,101 men left on base and have an OPS of .765. They have scored 4.74 runs per game and totaled 749 runs this season. Who will win tonight's Brewers/Cardinals MLB game against the spread?